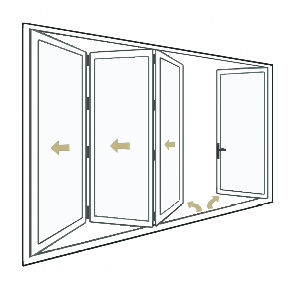 Bi-Fold Glass Walls operate with each panel folding on top of the adjacent panel to open. 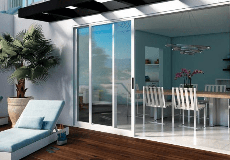 Enjoy the best of indoor-outdoor living with Milgard's Bi-Fold Moving Glass Walls. Available in custom and standard sizes, add Bi-Fold Glass Walls to your home for a beautiful and distinct look. All aluminum frames and panels are thermally broken with a full weather-stripped structural interlock system for improved energy efficiency. Milgard Bi-Fold Glass Walls are designed with a water barrier sill to help provide protection from water penetration. The 1.5" interior leg helps keep water from entering inside the home and the back leg penetrates the track for additional protection against exterior elements. To keep your bi-fold door in good working condition for years to come, please watch this video for proper operation. Unfold the potential of your living space with Milgard's Moving Glass Wall Systems.The Bi-Fold style operates with each panel folding on top of the adjacent panel.